Alan Chargin shares stories behind how Capitol Hill small businesses got their start. 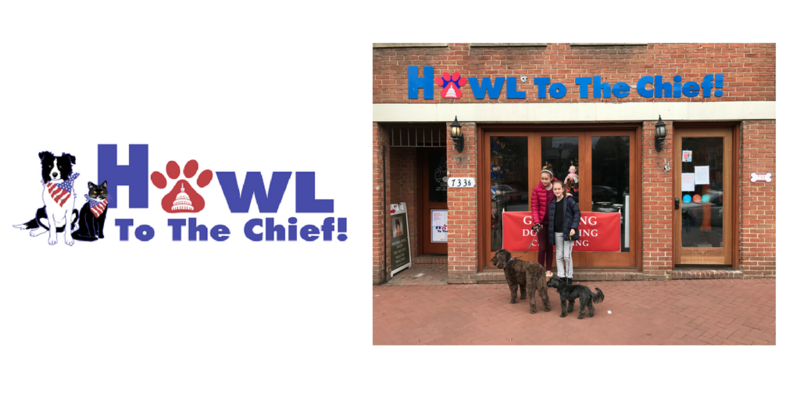 This week, he sat down with Kimberly Hawkins, owner of Howl to the Chief. The following conversation has been edited for clarity and brevity. Tell us what everyone should know about Howl to the Chief. We serve most small animals, not just cats and dogs. Our store is very pet-friendly and we offer self serve dog washes for $15. We’ve got excellent grooming, dog walking and pet sitting services that I hope our customers can take advantage of. And we’re working really hard to offer convenient delivery for people’s orders. I was a sales rep for a pet food distributor so the previous owner (when the store was Doolittle’s) was a customer of mine. I was looking to make a change because my company was acquired and wasn’t the same as it once was, and I’d also always had owning my own pet store in the back of my mind. When I found out the store was for sale, and I was able to get financing from the previous owner, it was actually a pretty quick process. Was that a tough process, purchasing a business from someone else? Honestly not really. I was pleasantly surprised. I knew what I wanted and this store was a good fit. I also knew all the products well already having been in the industry. We really just needed to negotiate price and financing terms, and then let attorneys handle the paperwork. That’s great. Then what would you say has been the toughest or most surprising? Where should I start? I kept my sales job for the first 6 months to train my replacement and keep the extra money coming in, so it was a lot of work to do that plus get the business functioning how I wanted. We had a good deal of renovation to do in the beginning too to make the store more presentable. I had to learn the business cycle/calendar and how to manage inventory to match it. As everyone in retail knows, August is extremely tough since so many people are traveling. And of course, staffing has always been a challenge. We’ve had a great team now for the past couple years, but turnover is just high in retail and it can be tough to manage others and delegate, so for a long time I just felt I had to always be in the store. How about e-commerce, how has that impacted the way you do business? It’s had a tremendous impact on more businesses than just mine. We offer a great loyalty program: $20 back every $500 you spend, $50 back every $1000 $50. We accept manufacturer UPC coupons that amount to approximately 1 free bag of food every 10-12 bags. We hold ourselves very accountable for delivering excellent customer service is outstanding and it’s our most complimented feature. The fact remains that trying to compete on price with online retailers is a losing battle. For example, Mr. Chewy’s was pricing their products TOO low, but manufacturers weren’t enforcing it. It took a lot of independent retailers and distributors reacting strongly for them to finally tighten up about their pricing standards. Plus, the small business inevitably ends up looking worse to the customer when our prices are higher, even though most of it comes from the supply chain, not us. We understand things are constantly changing with technology, and especially the younger generations are increasingly doing things online and on apps. There’s also not a ton of brand loyalty anymore– that’s just the way it’s going to be. We’re fortunate that Capitol Hill is very supportive of its small businesses, and we will continue to work hard to offer more and more competitive services to survive. Would you say you prefer owning a business to your previous sales job though? I go back and forth on that. I’ve never come close to earning the salary I earned as a sales rep, and some of the challenges of business ownership are a lot more stressful than the challenges you face as an employee, because the buck stops with you. But I do like having a (somewhat) flexible schedule, and feeling the satisfaction of seeing your customers’ appreciation for what you do, and the many animals’ lives we get to personally impact. The Rural Dog rescue operation I started months before I bought Howl to the Chief was really the final motivating factor for me to do it. It’s called Rural Dog Rescue, and I started it 8 months before buying the store. We focus on saving dogs from high risk economically challenged kill shelters, and it’s 100% foster based. Our adoption events at Howl to the Chief are a big driver of Rural Dog Rescue’s success. A lot of our customers are foster families and vice versa. We’ve helped facilitate the adoption of over 1600 dogs since 2012, which is something we’re very proud of. What are your goals for the business for the rest of the year? I’d like to diversify our advertising: We haven’t seen a very strong return from print advertising lately so I’m trying to focus more social media. We’re excited about doing another Halloween contest in Lincoln Park: We had about 80 dogs last year and it was a blast, so I hope everyone keeps an eye out for that. Our sales are actually up 12% from 2017 so I’m just working hard to make sure we stay on track, and there will be plenty of events and demonstrations planned to keep giving people reasons to come in! Our grooming department is also booming, so I’m trying to hire more groomers and give those customers another reason to visit the store. We leave gift bags behind after some dog walks–I hope this helps people see our products ,too. What advice would you offer someone opening a business? Make sure your financial situation allows you plenty of cash to get through the beginning stages. My biggest regret is having ‘terms’ with suppliers instead of paying cash because it made it so much harder to do the budget with so many unexpected variable. I would also recommend having a partner to share the responsibility with. There were many times, and still are times, when I just feel overwhelmed as the sole owner. Did you experience any unique challenges as a woman-owned business? Honestly no. I’ve noticed a majority of Capitol Hill businesses are owned by women, which is great, so it’s not really a big issue. We definitely do promote it, though. Time for a little fun. How many pets do you own? I have 6 dogs, 3 cats, 4 chickens, and 1 horse, plus the dogs that I foster. They’re the main reason I can’t live in DC! What dog food brand is the tastiest? (Laughs) I’ve never tried the dog food, but I’ll admit I’ve tried the homemade dog cookies and they’re actually not bad. What is the best dog trick you’ve seen in your store? There’s a big golden retriever who comes in and carries the owner’s purchases out in a bag, it’s pretty great. Any specific organizations to mention that were helpful to you in getting started? Yes- Barracks Row Main Street was a great resource in the beginning, and still is! Thanks for your time Kim. Anything else you’d like to mention before we wrap up? We’re really working hard to improve our delivery services with Postmates, so I hope everyone will give that a try if delivery is important to them. And everyone should definitely watch out for our dog costume contest in October. 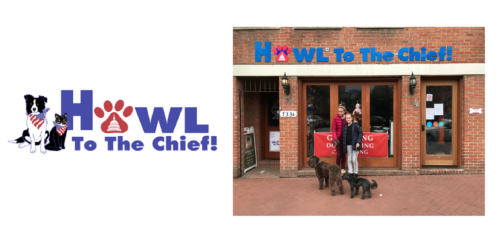 Follow Howl to the Chief on Facebook, Twitter and Instagram, and of course visit them at their 733 8th St SE location. Their dog walking partner is usually hiring so be sure to also check out their jobs page. Please leave a comment below, follow me on Twitter or email me at alan.chargin@gmail.com.